New 9 story core and shell office building to house commercial and institutional tenants. Electrical services include 4000amp and 1000amp bus duct, lighting, lighting controls, 2,500sf snow melt system and a 500KW diesel generator emergency system. Low Voltage systems include fire alarm, security, access control, visitor processing, IT network fiber back bone. CM Richey hand-picked to execute 500sf high profile, high exposure 5th Avenue project. Switchgear, general power, lighting & controls. New 124,000sf, 5 story, 146 Unit, Assisted Living facility. 4000 Amp Service, 500KW emergency generator, fire alarm system and LED lighting. 130,00sf, high-end interior fit-out for a new Century 21 department store. The 4 floors of this space are comprised of architectural LED lighting and full fire alarm system. It is the anchor store located in City Point Brooklyn's premier retail facility. 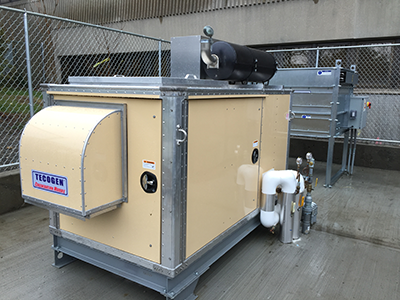 75KW Cogeneration Plant with Associated Mechanical Equipment (Pumps, Fan, Aquastats & Glycol Fill Station). System is designed to subsidize Utility Electrical Power and Create Heat as a Byproduct for Hot Water. 6,500sf renovation of a historic building to a 5-star restaurant. 8,200sf 5th floor student classroom, science lab & restroom renovation. Services include switchgear, general power, lighting & lighting controls. Project was completed with an accelerated schedule in time for the incoming classes. The Fresh Direct distribution center being built by Schimenti Construction in the Bronx is a 600,000sf project requiring several contractors to deliver the MEP requirements for this complex scope of work. CM Richey, Inc was chosen to provide the power distribution system from the main incoming service point throughout the entire facility. This entails installing high, medium and low voltage equipment and wiring including: sub-stations, transformers, switchgear, specialty wire and conduit, generators, Automatic transfer switches, distribution panels and disconnects. This project requires a high degree of engineering and coordination between several trades. The rigging, staging, and over all safety plans are being developed well in advance. Electrical equipment and wiring coordination studies, testing and commissioning are extensive. We have several years experience with all aspects of this job and look forward to working with the Schimenti team to deliver another successful project. 7,000sf high-end product showroom and studio. Switchgear, general power & lighting controls. Project highlighted by advanced lighting control system capable of controlling over 300 track heads and fixtures individually. Switchgear replacement of (2) 4,000amp services for a 32 story apartment building. Required detailed layout and planning with ConEd and building owners to ensure no area of the building was without power for more than 24 hrs. 4000sf build-out of a new retail store in downtown SoHo. Remodel of several supermarkets acquired by Stop and Shop this year. New lighting, registers, signage, energy management systems and much more. Since the downtime schedule for each store was only 1 week the work needed to be coordinated perfectly and was done on multiple shifts over 24hr periods. 2,500sf student gym, restrooms and office renovation. Services include general power & lighting, HVAC power. Project was completed with an accelerated schedule on time for the incoming classes.